Dr. Smith's ECG Blog: It is not a STEMI; it is an opportunity to save myocardium! It is not a STEMI; it is an opportunity to save myocardium! I was teaching about subtle coronary occlusion at EKG conference to our residents a couple days ago. About coronary occlusion that does not meet STEMI criteria and that many physicians would miss. They were asking me about whether, if they missed one of these, would they have missed a STEMI? "No, you would not have missed a STEMI, and you would not be blamed for anything, but you would have missed an opportunity to save the patient's heart." Just as I was explaining this, a text message came through from a former resident, with this ECG and the question: "Diagnostic ECG?" Notice the computer only sees the inverted P-waves. The residents all chimed in: "Do not miss this opportunity!" So I texted back: "Do not miss this opportunity to save the patient's heart. It is definitely diagnostic." 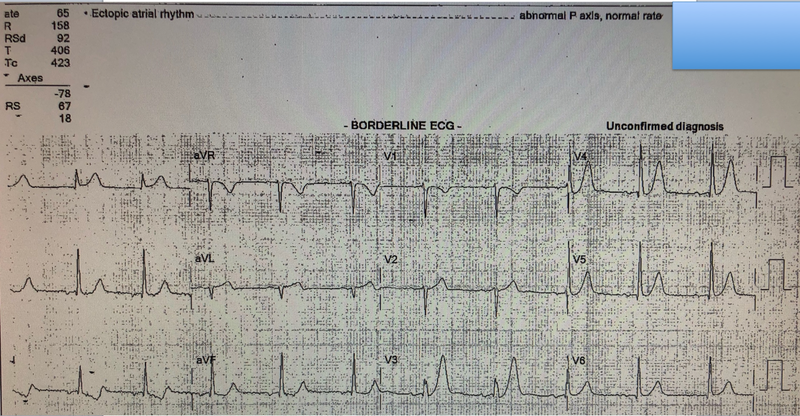 The medics transmitted this to the Emergency physician, asking whether cath lab activation was indicated or not. The emergency physician diagnosed coronary occlusion (based on the STE in I and aVL, with reciprocal STD in lead III and the hyperacute T-waves in V3-V5). A cardiologist somehow got involved. He disagreed and said not to activate, and "instead of listening to me," commenced to "educate me as to why the EKG is normal." The pair of leads III and aVL are diagnostic of occlusion. The hyperacute T-waves in V3 and V4 are diagnostic of occlusion. The combination is diagnostic of proximal LAD occlusion. A 60-something man, previously healthy, has sudden CP and diaphoresis. He presented to a clinic where the ECG (not available) was normal and there was a negative single troponin. He was discharged to home from the clinic. He called 911 for recurrence of pain. "Given the history, you could almost activate the cath lab without an ECG!" At angiogram, the proximal LAD was occluded. Dear Dr. Smith, I only wanted to say thanks. Your blog and your books are my inspiration. I am a resident in internal medicine and cardiology in Germany and I have diagnosed subtle STEMIs in many patients in Germany and Switzerland and I teach my medical students and other colleagues to do not dismiss subtle STEMIs. I had a patient with an acute occlusion of the LCX and with subtle ECG changes (slightly ST depression on V2-V3) and normal troponin. My consultant (cardiologist) did not wanted to perform PCI but I insisted because she become bradycardia with junctional rhythm. The patient had a acute occlusion of the LCX on PCI. Thank you Dr. Smith, your blog is my inspiration and guide. Thanks for the feedback. I'm so glad you've learned from the blog and it has helped you care for patients. Viel Gluck in der Zukunft! Thanks for the case! I have one question: when I first saw the ECG #1 I noticed a subtle STD in V3-V4 followed by a tall T wave. Would it be wrong to call this de Winter's T waves? They are indeed de Winter's T-waves because of the very subtle ST depression. But de Winter's are a type of hyperacute T-wave, and there is a spectrum of hyperacute T-waves from deep ST depression (depressed ST takeoff) to ST elevation before the hyperacute T-wave. They all mean the same thing: extremely tight LAD with very low flow to complete occlusion. Dr. Smith, the Twaves in V3&V4 look very narrow and peaked, like hyperK. How do you know these are hyperacute? Is it bc of the terminal QRS distortion? HyperK T-waves have more narrow base, preceded by a more flat ST segment that then abruptly turns upward, then ends in a very sharp T-wave peak, as if held up by a string. These do not have a flat ST segment and do not have a sharp peak. If you're not sure, just check a potassium! it is sad that sometimes our colleagues attempt to belittle us; some of my biggest errors have been when i deferred to the "specialists" or consultants, assuming that they were automatically correct given their title. that is why we need to "own the ekg", and its correct interpretation. Sort of, barely, almost. Hybrid with simple hyperacute T-wave. It all means the same thing. Dear Dr Smith, thank you very much again for another excellent case. Your lectures have greatly improved my ECG reading skills. Obviously, we must be very vigilant in angina patients whose ECGs display disproportionately large T waves, regardless of the ST status.